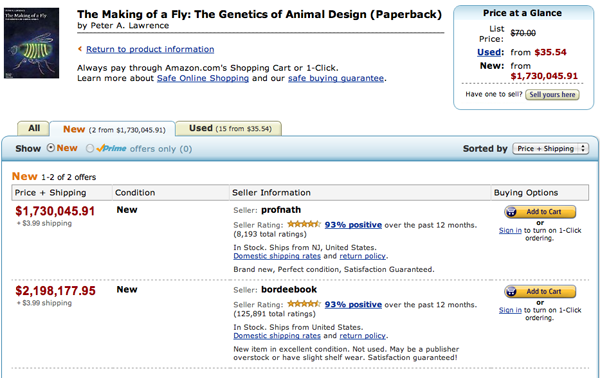 A few weeks ago a postdoc in my lab logged on to Amazon to buy the lab an extra copy of Peter Lawrence’s The Making of a Fly – a classic work in developmental biology that we – and most other Drosophila developmental biologists – consult regularly. The book, published in 1992, is out of print. But Amazon listed 17 copies for sale: 15 used from $35.54, and 2 new from $1,730,045.91 (+$3.99 shipping). I sent a screen capture to the author – who was appropriate amused and intrigued. But I doubt even he would argue the book is worth THAT much. At first I thought it was a joke – a graduate student with too much time on their hands. But there were TWO new copies for sale, each be offered for well over a million dollars. And the two sellers seemed not only legit, but fairly big time (over 8,000 and 125,000 ratings in the last year respectively). The prices looked random – suggesting they were set by a computer. But how did they get so out of whack? Amazingly, when I reloaded the page the next day, both priced had gone UP! Each was now nearly $2.8 million. And whereas previously the prices were $400,000 apart, they were now within $5,000 of each other. Now I was intrigued, and I started to follow the page incessantly. By the end of the day the higher priced copy had gone up again. This time to $3,536,675.57. And now a pattern was emerging. On the day we discovered the million dollar prices, the copy offered by bordeebook was1.270589 times the price of the copy offered by profnath. And now the bordeebook copy was 1.270589 times profnath again. So clearly at least one of the sellers was setting their price algorithmically in response to changes in the other’s price. I continued to watch carefully and the full pattern emerged. Once a day profnath set their price to be 0.9983 times bordeebook’s price. The prices would remain close for several hours, until bordeebook “noticed” profnath’s change and elevated their price to 1.270589 times profnath’s higher price. The pattern continued perfectly for the next week. But two questions remained. Why were they doing this, and how long would it go on before they noticed? As I amusedly watched the price rise every day, I learned that Amazon retailers are increasingly using algorithmic pricing (something Amazon itself does on a large scale), with a number of companies offering pricing algorithms/services to retailers. Both profnath and bordeebook were clearly using automatic pricing – employing algorithms that didn’t have a built-in sanity check on the prices they produced. But the two retailers were clearly employing different strategies. The behavior of profnath is easy to deconstruct. They presumably have a new copy of the book, and want to make sure theirs is the lowest priced – but only by a tiny bit ($9.98 compared to $10.00). Why though would bordeebook want to make sure theirs is always more expensive? Since the prices of all the sellers are posted, this would seem to guarantee they would get no sales. But maybe this isn’t right – they have a huge volume of positive feedback – far more than most others. And some buyers might choose to pay a few extra dollars for the level of confidence in the transaction this might impart. Nonetheless this seems like a fairly risky thing to rely on – most people probably don’t behave that way – and meanwhile you’ve got a book sitting on the shelf collecting dust. Unless, of course, you don’t actually have the book…. My preferred explanation for bordeebook’s pricing is that they do not actually possess the book. Rather, they noticed that someone else listed a copy for sale, and so they put it up as well – relying on their better feedback record to attract buyers. But, of course, if someone actually orders the book, they have to get it – so they have to set their price significantly higher – say 1.27059 times higher – than the price they’d have to pay to get the book elsewhere. What’s fascinating about all this is both the seemingly endless possibilities for both chaos and mischief. It seems impossible that we stumbled onto the only example of this kind of upward pricing spiral – all it took were two sellers adjusting their prices in response to each other by factors whose products were greater than 1. And while it might have been more difficult to deconstruct, one can easily see how even more bizarre things could happen when more than two sellers are in the game. And as soon as it was clear what was going on here, I and the people I talked to about this couldn’t help but start thinking about ways to exploit our ability to predict how others would price their books down to the 5th significant digit – especially when they were clearly not paying careful attention to what their algorithms were doing. But, alas, somebody ultimately noticed. The price peaked on April 18th, but on April 19th profnath’s price dropped to $106.23, and bordeebook soon followed suit to the predictable $106.23 * 1.27059 = $134.97. But Peter Lawrence can now comfortably boast that one of the biggest and most respected companies on Earth valued his great book at $23,698,655.93 (plus $3.99 shipping). This entry was posted in misc stuff, science. Bookmark the permalink. Both comments and trackbacks are currently closed. i wonder which one of the merchants corrected there price.. Thanks for the explanation on algorithms; I love your expression about the lack of “a built-in sanity check.” A coffee-table book I authored, which is currently out of print, suddenly jumped in price from $39.95 to over $500 new and over $900 used on Amazon. At first I thought, “Wow! I shoudda hung onto more copies myself.” But I thought there had to be something strange going on. Your explanation makes sense of the situation. Thanks for the article. When I checked my Amazon wish list today I saw that a book which usually lists for around $4 had gone up to a low price of $228 and a high of $35,000. I had no idea what was going on, and appreciate your information. If the algorithm explanation is correct and one seller is bouncing of the other is it possible that neither of them actually has the book? Possible, but more likely that one has, one doesn’t. Couldn’t I find when their algorithm updates, list my book at like 10 cents, buy theirs and then unlist mine? I think that’s an awesome idea, maybe even a software, that detects these algorithms and posts lower prices to reduce the sellers prices, there could be a lot of money made that way or at the least make people think twice about checking their prices instead of leaving it up to an equation. i wonder which one of the merchants corrected there price. in them increases and decreases. remain available for long at a lower price! Thank you, again, for your interest. In other words, the very act of viewing the book “increases the value.” Going back again the next day shows more it has even more interest and the price goes up again. This one has a used book for $21 billion. Thanks for reminding us all of the simple things in life that make our days AWESOME! Thank you for this info. I will be more cautious when shopping on amazone. Yes the price is flexible, and has become a commodity in itself. Not just another marketing function. Thank you very much for the explanation of algorithms. Would not surprise me if they use a simple formula of future prices to reach the price they set. I am impressed by your observation and your ability to explain the circumstances of this pricing event. I enjoyed reading your post. My guess the data entry who entered it originally was bored and priced it at 23,456,789.01 and the auto-pricing system they use moved its price up and down in response to the other guy, who’s system was doing the same thing. The book was probably supposed to be priced at 25.00. It’s a good Amazon sales strategy, when there is a high value product promotions. Really interesting post. It is funny to see how the algorithms brought the prices up and up. unfortunately it’s what happens when sellers don’t check their prices or when there are glitches. better repricing software would require that minimum and maximum prices are entered before the algorithms take effect. I agree with what has been said. I think it’s best to try books with high demand. Very good article. Im surprised Amazon has allowed to post that boook for THAT amout. Well I guess they are making a cut from those crazy people buying the book. free tips for accomplishing 20 times more by registering at:. will quickly get you onto your customers’ wavelength. A company called Booknack is offering unused copies of my new book for $4,999.99 plus $3.99 for shipping. The book is available direct from Amazon for less than 12 bucks, with free shipping for more than 20 million people. I look up books for a living, and there are indeed some insane pricing schemes. Good you followed up so well! Interesting reading. I ran into a technical text on something about a dozen folks in the world could use (understand) and it was maybe 12K a copy, so I wrote and asked, but got no reply. I figured it could only be that they had it printed, and had to make back their costs with only a dozen copies…but now I wonder. There are several Amazon booksellers who consistently charge $24,000 and change for books that everyone else thinks might be worth a few hundred – and which most people think asre worth less than a hundred. I wonder – does anyone ever buy one for 24 thousand dollars????? This is one crazy bunch of sh*t.
I still have 63 out of 150 soft cover books that I purchased through Balboa Press. I wonder what would happen if I advertised them on Amazon at the normal price of £11-95 as the last two copies. I think I will do this and see what happens. Yes I will do this and maybe some stupid fool will purchase them. I feel that this is the only way to combat these people. 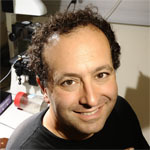 I'm a biologist at UC Berkeley and an Investigator of the Howard Hughes Medical Institute. I work primarily on flies, and my research encompases evolution, development, genetics, genomics, chemical ecology and behavior. I am a strong proponent of open science, and a co-founder of the Public Library of Science. And most importantly, I am a Red Sox fan. (More about me here). Unless otherwise noted, all content on this site is licensed under a Creative Commons Attribution 3.0 Unported License.